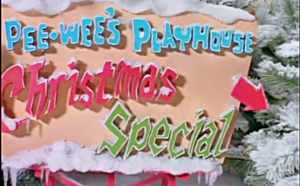 Pee-wee Herman and pals are celebrating Christmas in the Playhouse in their own creative ways: Pee-wee makes a list for Santa Claus 1 1/2 miles long, teaches Little Richard how to ice skate, goes for a sleigh ride with Magic Johnson, commands Frankie Avalon and Annette Funicello to make Christmas cards, receives a long phone call from Dinah Shore, even has more musical fun with Grace Jones, K.D. Lang, the Del Rubio Triplettes and Charo! Finally, Big Red arrives and announces that Pee-wee’s Christmas list was so big, he didn’t have enough presents for all the children of the world. Will Pee-wee follow his own advice and help others?